figure 14-18 Model of the genetic bases for sexual differentiation illustrating the primordial role of the SRY gene and its protein product, which is functional only in the 46XY male. In this model, the Z gene could be equivalent to the cytochrome P450 aromatase gene described in Figure 14-17. In the absence of the SRY protein (a 46XX female), the enzymatic capability to convert testosterone to estradiol is operative, whereas in a 46XY male, the aromatase enzyme is not expressed, which thus denies the embryo access to estradiol but provides it access to testosterone. Modified with permission from Odell, W. D. (1995). Genetic basis of sexual differentiation. In "Endocrinology" (L. J. DeGroot, M. Besser, H. G. Burger, J. L. Jameson, D. L. Loriaux, J. C. Marshall, W. D. Odell, J. T. Potts, Jr., and A. H. Rubenstein, eds. ), 3rd ed„ Vol. 2, pp. 1881-1887. W. B. Saunders, Philadelphia, PA.
fetus appears to be largely controlled by inherent tissue factors and genetics rather than by placental hormones. Selected aspects of fetal metabolism are affected to a degree by the fetal pituitary and placental hormones. With the exception of the catecholamines, the fetus is capable of functioning autonomously. The basal secretion rates of all of the anterior pituitary hormones are quite high by the end of the second trimester; by the third trimester their secretion is somewhat reduced, probably due to inhibitory feedback control. The production of Cortisol is known to occur in the human fetus by the 10th week of gestation; both Cortisol and dehydroepiandrosterone sulfate have been shown to increase after ACTH stimulation. Both glucagon and insulin secretion are reduced in the fetus; this may be a reflection of the relative constancy of the fetal blood sugar. Finally, the relatively high fetal serum calcium levels effectively suppress parathyroid hormone secretion and promote calcitonin secretion. The fetal kidney also is believed to be able to produce the dihydroxy-lated metabolites of vitamin D3, namely, la,25(OH)2D3 and 24(E),25(OH)2D3. There have been extensive studies dealing with hormonal control of mammary growth and function. The three principal hormones required for mammary gland maturation are prolactin, insulin, and Cortisol. There are two distinct phases of mammary secretory cell development: the proliferative phase and the differentia-tive phase. In the proliferative phase, stem cells present in the mammary gland divide into precursors or secretory cells. Proliferation is regulated by insulin, epidermal growth factor (EGF), and growth hormone, all of which act as mitogenic stimuli. Prolactin (PRL) appears to sensitize the stem cell to the action of insulin and may act like a mitogen itself. In the differentiative phase of mammary gland secretory cell development, a number of hormones are involved. Glucocorticoids (Cortisol) are important and appear to play a role in this process. Prolactin and insulin are also critical. The secretory cells can appear in the absence of prolactin (in organ culture), but they will not produce milk constituents. Apparently the mRNAs for the milk proteins are under the control of PRL, but Cortisol probably plays a role here. Cortisol may be required for PRL to elevate the mRNAs for milk proteins. Both estrogen and progestin also stimulate the development of the mammary gland and the estradiol-stimulating duct, as well as causing a lowering of prolactin release inhibitory factor (PIF) to generate PRL release, progesterone-stimulating alveolar development, and a lowering of the level of PIF (Figure 1419). In addition, estradiol may stimulate the release of PRL at the anterior pituitary through a mechanism involving the corticomedial amygdala of the limbic system. An important point is that, although PRL is being secreted in pregnancy and the mammary gland is developing, milk is not being synthesized due to the high levels of progesterone, which may block the glucocorticoid receptor. At term, free progesterone levels fall and the mammary cells become functional, as shown in Figure 14-19. The principal target organ for prolactin in the female is the mammary gland. 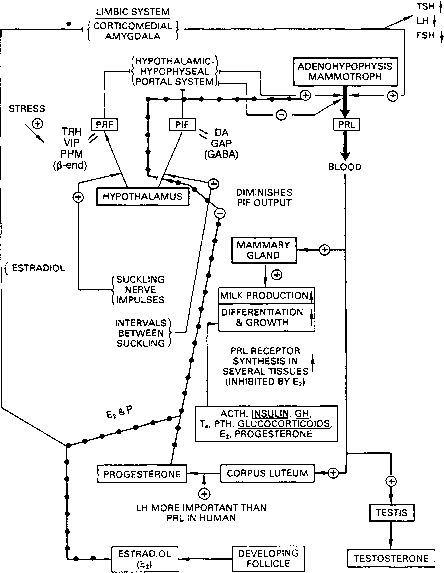 Figure 14-20 shows a postulated mechanism of action for prolactin to describe its biological actions in stimulating the synthesis of milk constituents in the mammary gland. Eventually, after PRL interacts with its membrane receptor, nuclear activation occurs and the messenger RNA levels increase for the milk proteins casein, a-lactalbumin, j8-lacto-globulin, and so on (see Table 14-1). figure 14-19 Schematic diagram of the regulated secretion of prolactin from the pituitary and summary of its biological actions. + indicates stimulation; — indicates inhibition. Abbreviations: VIP, vasointestinal peptide; PHM, peptide histamine methionine; GAP, gonadotropin-associated peptide.